Have you always wanted a straight smile but do not want to deal with the visibility or hassle of metal braces? You are not out of options. Get the results you want using the clear choice in orthodontics. With Invisalign in Towson, we move your teeth into their ideal positions to make a long-term investment in your oral health and your self-esteem. In about one year, you will have the smile you have always wanted using a nearly invisible treatment. Invisalign is far different from traditional braces. No brackets or wires are used to move your teeth. Instead, you wear clear aligners over them to reposition your teeth. This provides you with a discreet and sophisticated solution, so you do not need to feel insecure about your appearance while undergoing your treatment. The aligners are also removable, resolving many of the disadvantages of traditional braces. You will not have any dietary restrictions; however, you should only have water while wearing them. Since you can take the aligners out, brushing and flossing your teeth is a breeze because there are no brackets or wires to clean around. You will also enjoy a more convenient and comfortable treatment. The aligners are smooth, so you do not need to worry about any irritation to the inside of your lips or cheeks. You will also spend less time visiting your dentist in Towson because you do not need appointments for adjustments. When used on the ideal candidate, Invisalign produces the same high-quality results as metal braces. After performing your initial consultation, we take 3D impressions of your mouth to map the movement of your teeth. We create a series of aligners, which you must wear for at least 22 hours per day. You wear each aligner for about one week before switching to the next. On average, it takes about 12 months to complete your treatment. Afterward, you need a retainer to prevent your teeth from moving back into their previous positions. While on your journey to a straight smile, it is important to maintain your oral hygiene at home by brushing twice a day and flossing every night. Take the time to clean your aligners daily using a soft-bristled toothbrush and a clear antibacterial soap. Although the aligners are durable, they can break. To prevent damage, do not eat or drink anything except water while wearing them. This also helps to ensure they maintain their translucent appearance. You will need to maintain regular appointments with our office, so we can monitor the movement of your teeth. Do not forget to visit your dentist twice a year for a cleaning and checkup as well. Now, you can get the straight smile you have always wanted using the preferred orthodontic system for teens and adults. Contact our office today to schedule your consultation to see if Invisalign is right for you. We look forward to giving you the smile you deserve. Before you start any treatment, you want to make sure you feel confident and fully informed about your decision. We understand and agree with you completely! That’s why we have provided the answers to these common questions about Invisalign. If you’d like even more information, we invite you to schedule a consultation with us! The cost of Invisalign treatment will vary case by case. It greatly depends on the severity of your tooth misalignment and how long your treatment will be. However, in many cases, Invisalign costs about the same as traditional braces. The best way to know the specific costs associated with Invisalign is to schedule a consultation with us so that we can review your unique case. We also offer in-house financing to make any treatment affordable within your budget. 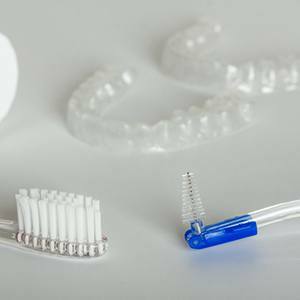 How do I maintain my oral hygiene during Invisalign treatment? The metal brackets and wires of traditional braces present obstacles that you have work around to try to keep your teeth clean. But because the Invisalign clear alignment trays are removeable, you can easily maintain your healthy oral habits during treatment. In fact, Invisalign encourages even better oral health. In addition to brushing twice and flossing once your teeth every day as you normally would, you should brush your teeth after you eat and before putting the trays back in so that food particles aren’t trapped in the aligners. How do I take care of my clear aligners? 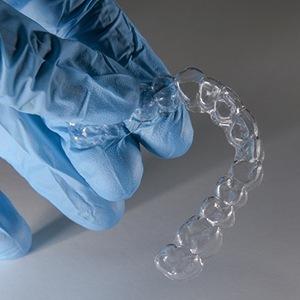 Invisalign clear aligners are surprisingly easy to take care of. Every night, use your toothbrush and toothpaste to gently scrub your clear aligners. Then, rinse them off and put them back in your mouth. It’s that simple! Who is an ideal candidate for Invisalign? Invisalign is a teeth straightening solution meant for teens and adults alike. However, you should keep some things in mind when considering Invisalign. It’s important to follow our instructions to get the best results. Not doing so can cause delays and extend the timeline (and therefore the cost) of treatment. 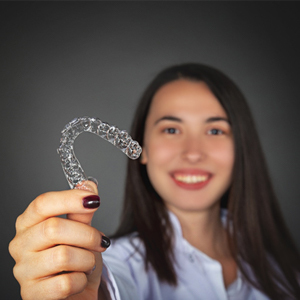 You also need to be in good oral health to be considered for Invisalign treatment, and if your alignment issues are too severe, you may need to have traditional braces. To know whether you qualify for Invisalign, contact us to schedule a consultation.